Arx Rosarum is a Latin phrase meaning Castle of Roses. 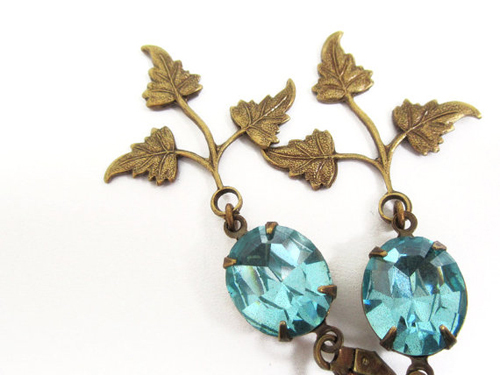 This beautiful name coincides perfectly with the history inspired and highly thoughtful jewelry work of Ruusu, a young jewelry artist and an Etsy seller. She got into handcrafts at the age of 5, insisting her mum to sign her up for a ceramic school. Mum yielded and Ruusu got to learn ceramics for the next 5 years. That’s when she made her first pieces of jewelry; geometrical earrings for her mum. 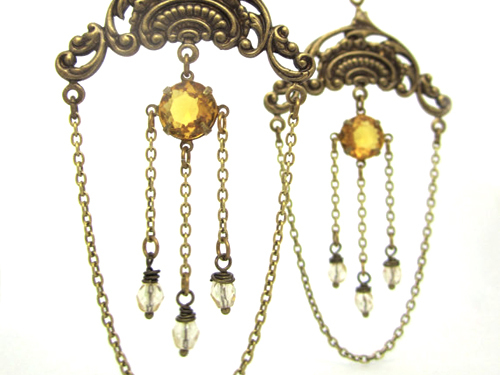 Today Ruusu designs and makes costume jewelry. 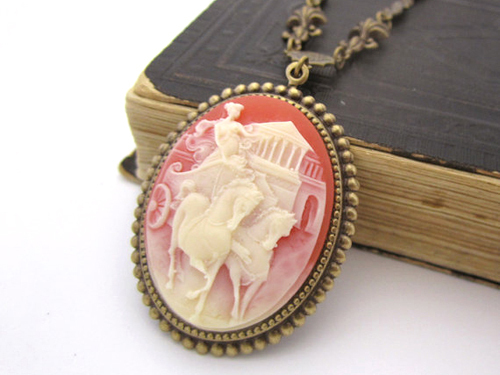 In her pieces she uses lots of vintage components like glass jewels, cabochons and cameos. 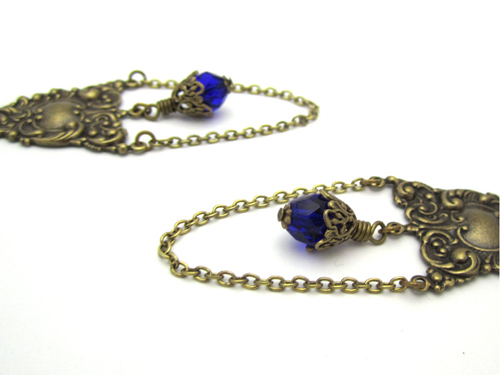 “These products were made for jewelry industry decades ago – now I’m giving them a chance to be finally a part of a wearable piece.” The talented jewelry artist combines old materials with new glass and crystal beads and high quality brass stampings made with vintage dies. 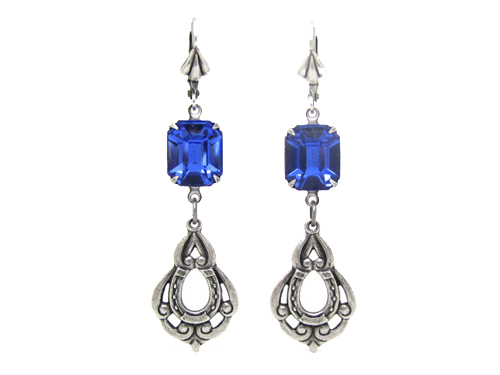 The amazing earrings channel the glowing glamour of Art Deco. 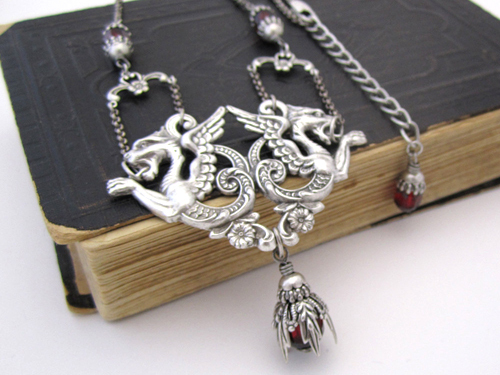 Here you can feel the presence of Art Noveau’s mythic tales. 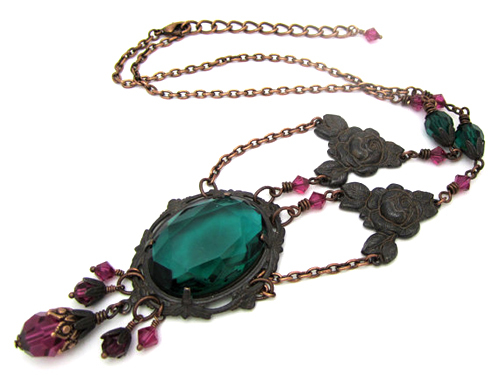 Inspiration for the necklace wells from dark shades of Victorian splendor. When Ruusu joined Etsy few years back as a customer, she had no idea that someday she’d be running her own shop. 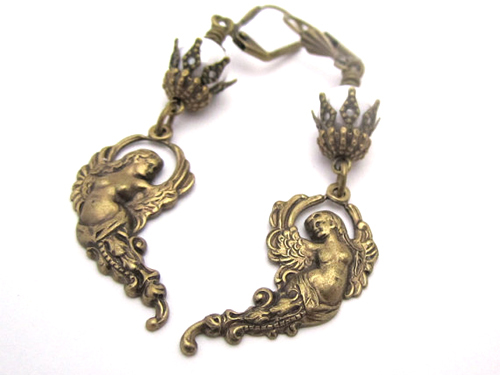 First the jewelry maker sold pieces to her friends and later participated her first fair on the fall of 2011. After trying to sell her products on a Finnish site she turned her eyes to Etsy again and finally opened Arx Rosarum Etsy shop in January 2012. Later this year Ruusu is planning to widen her website to include an online shop of her own.